Plenty of room for two to join in some relaxing fun! 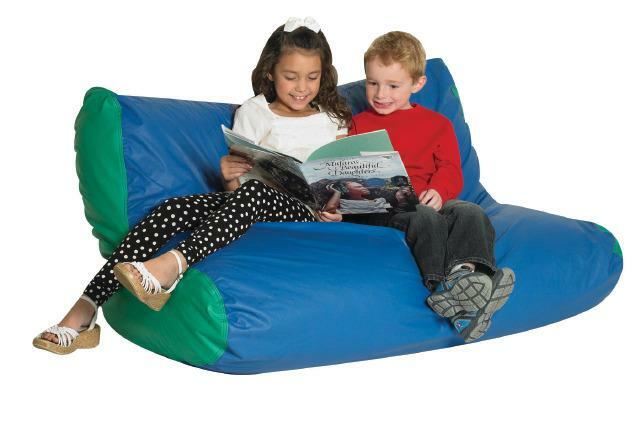 This durable, vinyl high-back bean bag has double-stitched seams and double safety- locking zipper. Sized for Ages 4 years and up. Please specify colors when ordering: Blue/Red or Blue/Green. CPSIA Compliant and Phthalate Free. THIS ITEM WILL DROP SHIP FROM THE MANUFACTURER AND TAKE 10-14 DAYS FOR DELIVERY. Dimensions: L: 30" x W: 50" x H: 27"